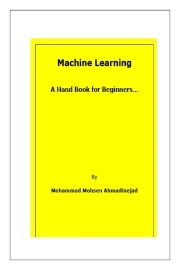 Description of "Machine Learning (eBook)"
Machine learning, a branch of artificial intelligence, is a scientific discipline concerned with the design and development of algorithms that allow computers to evolve behaviors based on empirical data, such as from sensor data or databases.Applications range from datamining programs that discover general rules in large data sets, to information filtering systems that automatically learn users' interests. To solve problems computers require intelligence. Learning is central to intelligence. As intelligence requires knowledge, it is necessary for the computers to acquire knowledge. Machine learning serves this purpose. Machine learning refers to a system capable of acquiring and integrating the knowledge automatically. The capability of the systems to learn from experience, training, analytical observation, and other means, results in a system that can continuously self-improve and thereby exhibit efficiency and effectiveness. Bayesian Decision Theory, Computational Learning Theory, Artificial Neural Network, Instance-Based Learning etc. This book provides a single source introduction to the field. The author is a postgraduate in computer science and interested in science communication. He has worked on several projects related to Machine Learning in Iran and India. He is perusing is PhD in computer science and co-authoring several research papers. Reviews of "Machine Learning (eBook)"